Portable toileting where access to toilet is difficult. 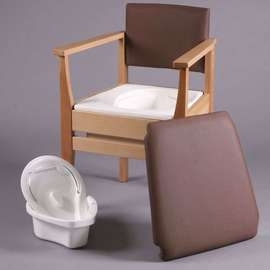 The Deluxe Commode offers a discreet potty and the contemporary design avoids any embarrassment to the user. 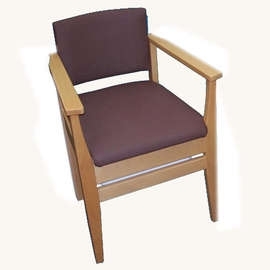 Ideal for the living room or bedroom, the commode comes in an attractive chocolate coloured vinyl upholstery and has a polished hardwood frame. The padded seat and backrest provide excellent comfort and support, while the upholstery allows easy cleaning and is removable. By removing the cassette, which contains the potty, it allows soiled parts to be cleaned away from the bedroom. The locking lid when carrying the potty seals the contents for easy disposal. Seat depth: 510mm (20"). Seat width: 430mm (17"). Height to seat: 500mm (19½"). Height to arms: 680mm (26¾"). Overall height: 800mm (31½"). Aperture: 240 x 330mm (9½ x 13"). Footprint: 470 x 510mm (18½ x 20"). Product weight: 12.5kg (27.5lb).